The Casual Vacancy is very much for an adults-only crowd, and is quite a departure from everything else Rowling has written. While the pages are peppered with drug use, strong sexual scenes, bullying, and so much more, it is surprisingly honest int its approach to reveal the ridiculous expectations of social norms and hypocrisy. At its core is a novel with a biting cut into contradictions at all levels, and while it may be lewd in some sections, it is exact in its perspective of how people really can be. Although there are an overwhelming number of characters to the point of initial confusion, each serve their purpose to tell the story, and the story is a daggone good one to read. Did I read this because I like the "other" books? Yes. I wanted to see how the first novel for adults would be like. Am I an avid JK Rowling fan? Not really. I mean, I love the Harry Potter world, and have one book in the series on my shelf, but I never camped out to get the next installment of Harry Potter. I don't think I've visited Pottermore online, unfortunately, and I even lived two hours away from the Harry Potter theme park in Florida and, while I always wanted to go, I never did in the two years I lived there before we moved back to Virginia Beach. I was sad when the last book and movie in the series was released, however. It's an incredible achievement and part of pop culture, whether or not you like the writing. Give Rowling a chance. She's created an incredible world before and assuming that The Casual Vacancy won't be any good just because you feel Harry Potter is theonlycharacterthatmatters is like relegating child actors with the same punishment simply because we can't see them as capable of anything else. Get through the first fifty to sixty pages. There are A LOT of characters and initially, it's hard to keep track of everyone. However, if you can get through that first section, it will not be tough to remember who is who as they are all memorable (and nasty). Then, you can settle down and enjoy the story. ( I would recommend that when the paperback is released, the publisher may want to add a "cast of characters" page as a reference. Yes, the synopsis sounds boring. I totally agree. It never grabbed my interest and maybe that's why it wasn't written under a pseudonym? Writing it under Rowling's name would guarantee purchases, whereas I don't think that writing it under a pen name would have made anyone care about the book, just based on the synopsis alone. So, forget about the synopsis. And, forget about the "other" books. Barry Fairbrother is the quintessential good guy. Although raised in the "Fields," the spot of town where the "riff-raff" live, he's been able to grow into more than his birthplace ever would suggest him to become and now lives in Pagford. With a wife and children, his place in the community as a family man who gives back is further extended with his seat on the Pagford Parish Council. His presence raises the hackles of others on the council, simply because Fairbrother, as his name would suggest, prefers to deal with the "Fields" and the town of Yarvil, fairly. Decades before, the boundary lines between Yarvil and Pagford overlapped by an accidental sale of property, and consequently, certain areas remain in Yarvil but are the financial responsibility of Pagford, namely the Bellchapel Clinic, which doles out needed methadone to recovering addicts in the immediate area. When the lease on the clinic comes up, a battle begins to take shape between Pagford and Yarvil, opening up the decades-old wound and no one is exempt from the fray. When Barry dies unexpectedly, his seat on the town council becomes a crucial spot that could swing the final decision of Yarvil and Pagford lines, and for Bellchapel staying open. It's now come to the final showdown, and with battles between parents and children, neighbors, friends, and spouses, everyone is fair game to suffer gossip and rumor. I tried to fluff up the synopsis a bit more to be somewhat more engaging and I'm not sure I did it any justice. I assure you that while no matter how challenging it may be to come up with a satisfying and intriguing overview of the book, it's really not possible. It just sounds so boring. But, my friends, I can also assure that this book ultimately is anything but boring. Just get through those first fifty or so pages! I read quickly and did not want to put it down. It's the sort of book to read while on a rainy day, and the weather complied the entire weekend in Virginia Beach so it fit perfectly for my mood. While the characters in the book are not the sort you'd ever want as your friend, social standards and hypocrisy are cut open and each protagonist is simultaneously a hideous antagonist. It is a reminder to turn the mirror on yourself initially before passing judgement on others and each character in this story is a contradiction through and through. With insincere people mangling the system we are expected to place faith in, Rowling's book comes out at a timely enough moment in American politics with the election right around the corner in November. The public battle the two towns wage is remarkably genuine to what you might expect to hear, both on a local and national scale, and I was truly transfixed. And although there were several well-intentioned characters (Kay, the social worker who cares about Krystal; Andrew, a young teenager who makes ill choices but ultimately wants to be better; Parminder, a doctor who cares about the Fields; her daughter, Sukhvinder who struggles with her own sad demons), each make their own ugly choices at some point that contribute to a breakdown in their families or either town, ultimately causing more havoc. Their thoughts about themselves and others can sometimes be horrifyingly unjust, yet how they carry themselves can seem quite the opposite. And although some want to help, the story thoughtfully trudges through the harsh reality that sometimes, a local system of government, social work, medical care, and more, can accidentally do more harm than good as well-intentioned people are held hostage by excessive rules. In the end, when it most matters to get involved in one of the most heartbreaking moments, it's tough to find anyone to step in. Instead, all who could have helped expected "someone else" to get involved, and that can be the most horrendous danger of all. Apathy may not be a crime, but disregard in the most obvious moment when it really matters, can be terrifying. Will you love this? Will you even like this? I can tell you that I did and quite a bit. I will advise you that preconceived ideas should completely be thrown out the window. JK Rowling has delved into the darker parts of humanity and she's done it extremely well, crafting a story with substance and surprise, one that kept me thinking even after I read the final heart-wrenching scenes. While there are a lot of characters, she ties it all up nicely with each characters' story concluding without confusion. I was surprised, comforted, shocked and ultimately content with The Casual Vacancy and I urge you all to give this book a chance. Forget the "other" books, forget the other big newspaper book reviews that were not glowing, and instead recognize that she, as an artist, surely can create more than one universe for us to enjoy. With that knowledge, I comfortably await her next book; it's certain to be another novel firmly entrenching us in another world of her creation yet again. Check back next week to read my thoughts which will include a few chatty spoilers! FTC Disclosure: I purchased the first edition hardcover on release day. It will stay on my shelves, thankyouverymuch. What can be written that you don't already know? Rowling is the creator and author of the Harry Potter empire, resulting in publications of the series in 73 languages and 450 million copies sold. The Casual Vacancy is her first novel for adults. 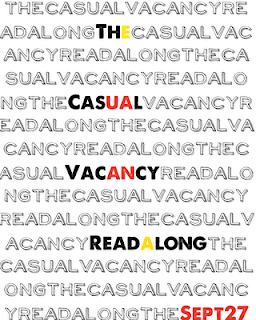 I am participating in The Casual Vacancy readalong, hosted by Literary Musings and Bookworm Meets Bookworm. I'm ecstatic that they created this since it jumpstarted me to read the book before the hype really got rolling! Thank you to you both! Great review. I have been thinking of picking up a copy. An anxious to give it a try. Thanks for the review. Even though I love the HP books, I was reluctant about this one because, as you said, the synopsis bored me. I didn't want to get disenchanted with Rowling. But I'm hearing more and more that the synopsis is deceiving...I think I might need to get my hands on a copy and try it out. I don't know why you say your synopsis is boring because it totally got me interested! However, I relate to your sentiment. Sometimes I feel like my book review is so boring and not really conveying how good a book is. Yet, because of the need to avoid spoilers not to mention lack of writing talent (in my case, not yours!) I just don't feel like I am doing a book justice! But here, I think you definitely did! You make me want to try this one. I just put a hold for it at the library. I hope to read this soon and will be sure to make a character map as I start it. Loved your post! Your enthusiasm for this book makes me want to read it :) I'll definitely be getting a copy sooner rather than later - thanks! Loved this -- I am not a Rowling fangirl either, but I don't like the rampant love/hate for her because this isn't a Harry Potter novel. Looking forward to reading this now -- sounds very good! It's good to hear a good review for this because everything I seem to have heard so far has been negative! I sort of wonder where all JKR's fans have gone to! I don't really understand it to be honest. I quit after 67 pages...the Fbomb just did me in. I agree that thinking of J. K. as someone completely different helped a lot! I also thought the synopsis sounded horribly dull. But I read it, got through the beginning character confusion, and came out in the end thinking that J. K. wrote a GOOD book, but not a fabulous one. I think most people reviewed the book in two ways: Disliking it completely because "it's not Harry Potter!!!" which is wrong because it's NOT HP and you can't judge it the same. Or loving it just BECAUSE it's J. K.
You have made very good points as to why you really enjoyed the book, which shows that you liked it because of the book itself and the commentary on people as opposed to "yay it's J. K.!!!" I think that Rowling is showing us another side to her. We all have G, PG, and R parts of our personality, and while HP is more PG-13, "The Casual Vacancy" is R. It's just another part of her personality showing up in this book, and we have to give her credit for that. I linked my review below in case you were interested!! I felt no interest in reading this book when I heard about it. But I've been following your posts about the book. I read some of the newspaper reviews you posted here and, rather than turn me off the book, they made me interested in reading it. I thought the paper's reviews weren't very good. The New York Times review was especially nasty, I thought and completely disrespectful. But those reviews got me interested in the setting and characters in The Casual Vacancy I was really interested in your final review. 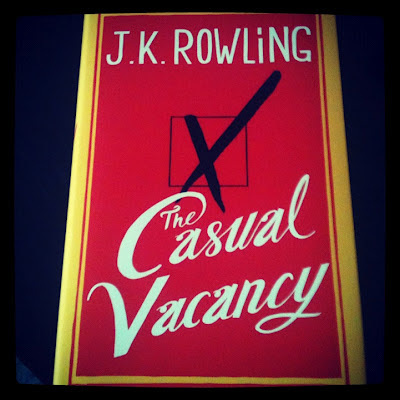 And now The Casual Vacancy is on my wishlist! This is a fantastic post and review. I totally agree that this book has nothing to do with Rowling's Harry Potter books. The news reviewers didn't seem to grasp that. I appreciate yor assurances that this book isn't boring despite the less than engaging synopsis (your synopsis is much better!) It puts me in mind of everyday life...it may seem boring in the big picture but it's the personalities and behavior of the people you encounter and spend time with everyday that spice things up and make it exciting, lively and/or scary! I found it pretty easy to separate this book from the Harry Potter ones -- it's so different in tone and genre, obviously, and the small writing tics that bothered me in the Harry Potter books weren't present in A Casual Vacancy. But the book wasn't any good for me. Alas. Not my thing. But I'm still willing to try whatever Rowling writes next. This is a wonderful review! As a reader, I so respect reading reviews where the reviewer does not go in with expectations. This is perhaps the hardest book this year, to eliminate expectations from, but you did it so well. You approached it without letting your feelings about the Harry Potter series invade your thoughts on this new novel. I will totally pick it up now. Thank you! Enjoyed your review, though I'll admit to not really enjoying the book so much thus far! I don't know . . . I'm on page 107, and I'm just feeling very bogged down and overwhelmed by the sheer number of "issues" the narrative seems intent on tackling and the novel's huge population. There are, like, 20 main characters. I'm not giving up, but I do think I'll be taking a short break and returning to the story in a bit . . . just need some time to wrap my head around everything! I really had no interest in reading this until you mentioned that it was lewd. Now I'm kinda interested. I feel encouraged to read your review because I come to this in doubt. Not that she can write a good story, just that she can write a good story for me. I'll let you know when I'm done, but if you liked it chances are I will, too. Awesome review. 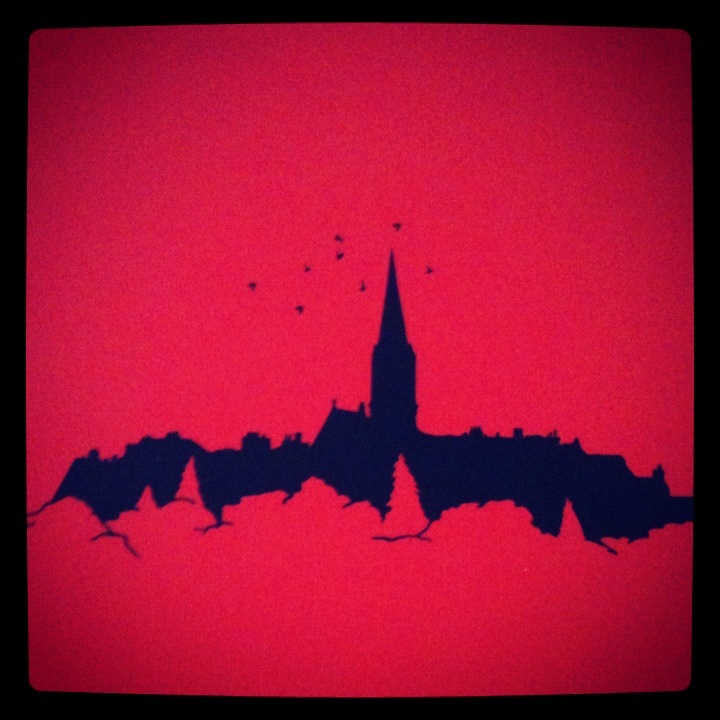 Yours is the first review I've seen of Casual Vacancy and I appreciate the honesty. I'm thinking that it's probably not for me.